Where do we position the Ladder? Where do we position the Engine? Where do you position the ladder? You can stretch hose but you cannot stretch a ladder! Engine just past Ladder in front. Unless the tactics dictate you wanting to have scrub on A and B sides or A and D sides, then one might choose to possition at a corner to maximize scrub. When would you position the ladder like in the above photo? When would you position the Engine in front of the fire building? On the fly, Looks like these brothers did the right thing concerning positioning. I agree with “firefirefire”…you’ve got…what you’ve got with the Truck. Was backing in, for better reach/scrub area, a possibility? While I won’t comment on this position specifically, because I don’t know the circumstances. The engine should initially have priority to establish the water supply (hydrant access, supply line, etc. ), but then the engine must proceed past or stop short of the fire building. Even considering backing into position if the truck gets in first and the water supply is nearby. Once the engine is in position, the truck officer and chauffeur must position the apparatus for what is happening now (fire or rescues) or in a nothing showing mode prepare for future use. The best position for the truck is the front of the building, but on a large area building with nothing showing, take a position close to the end of approach, in order that you only have to move forward once things begin to happen and without member assistance, because they should be inside investigating the call. (Inside and Outside lanes) Logistical forces drive apparatus placement most readily summed up by “you can stretch hose but not ladders” a common saying in the fire service. There has been no discussing of inside and outside lanes yet in these posting an alternative placement for the ladder in the picture above would be the outside lane next to the engine. This would allow a full roof scrub of both exposure roofs on the “B” “D” sides and free up room for other trucks/engines on a second alarm if need. On the 3 stories and below windows all necessary ladder work can easily be accomplished with ground ladders. 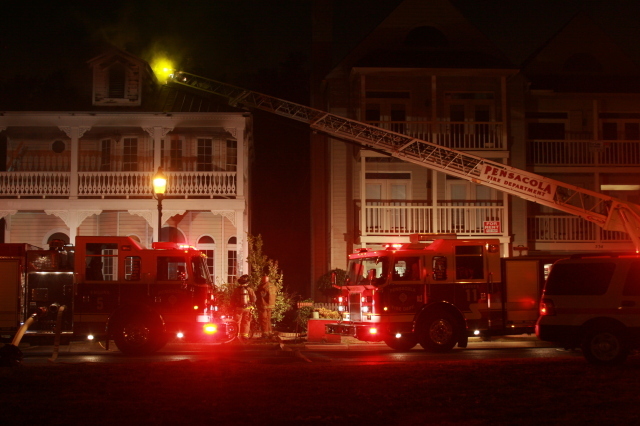 Length of 100′ aerial ladders (In departments that run 100′) on these three story buildings does not dictate a required need for extremely close aerial placement. For example if you need the full length you should have the turn table 25 feet horizontally from your objective. The outside lane can become every important in large buildings where the Engine company will need to stretch attack hose of 500 feet or more, you do not want to add another 100 to 300 feet unnecessarily to a already long attack stretch significantly delaying water on the fire. Think low rise office building, strip malls and warehouses. Many of these have parking lot that will allow for inside aerial sweep engine placement. On the other side of the coin in very hilly areas, congested with parked cars, and tight residential streets the truck crew may choose to place the truck at a near by intersection or pull off early with room for engines to pass and walk up with saws, irons, and ground ladders. This is very common in extreme hilly areas of California heavily urbanized hills, the priority here goes to water on the fire due to rapid spread to exposures, especially in summer the exposure become the whole neighborhood via vegetation fire spread. My point here is that apparatus placement must be driven be the needs to accomplish tasks when thinking about trucks’ aerial devices I like to run this through my head as used to place the truck on scene 1) rescue, 2) access to upper levels, 3) ventilation, and 4) fire suppression with aerial MS. Things not often considered, stability of the ground (surface conditions), weather (icing of device) and wind, electrical and other overhead obstructions, minimize angle and location of aerial do to hilly terrain (non parallel operation increase stress on ladder significantly), fire building conditions is collapse a strong possibility if fire progresses. In large complex positioning operations, it is best to take your time stage and place both engine and truck properly you usually only have on shot to get it right nothing worse than to see a 100 foot aerial parked in front of a ripping 2 story house with smoking exposures both side in the hills boxed in by engines on both side trying to make clumsy ridiculous long stretches. Of course the other possibility is also a problem, but I was an Engine guy most of my career and I made it a point not to block the truck my favorite was to pull past see three sides and stretch of the back. We must all work together to extinguish the fire, sometimes the truck needs front and center attention, sometimes it does not.